Why dream when you can own it? CaratLane.com, whose fabulous creation speaks a universal language of emotion and style, gives you the opportunity to make your dream come true. 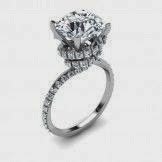 a) Send a picture/video/link or tell CaratLane.com what your dream solitaire looks like. c) Once approved, your dream solitaire will be sent for production and will be yours very soon. The jewellery we adorn, both, influence and exude our feelings, dispositions and persona. It conveys the idea of each individual’s personal style and fashion. There is nothing that brings a smile to your face like a self-designed solitaire adding a shine on your hand giving you the pleasure and pride of owning it. You definitely want to design your own sparkle to treasure it forever. With CaratLane.com, it is possible to give birth to a unique and exclusive solitaire ring. An endless combination for eternal, elegant, refined and perfectly proportioned solitaire with an appropriate expert advice is exactly what you are looking for. CaratLane.com believes in offering ultimate customer satisfaction by providing 5% Off on Solitaire orders over Rs.2 lakh.